Reduce over 95% of the AC Voltage on your body while practicing yoga or meditation on a Yoga or Meditation Earthing mat! Grounding the Human Body during Yoga Exercise with a Grounded Yoga Mat Reduces Blood Viscosity! This means that your blood carries more oxygen to your cells for more energy. 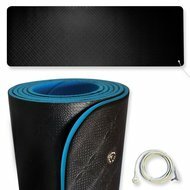 Earthing Yoga mat with special ca..
Earthing mat for meditation with ..